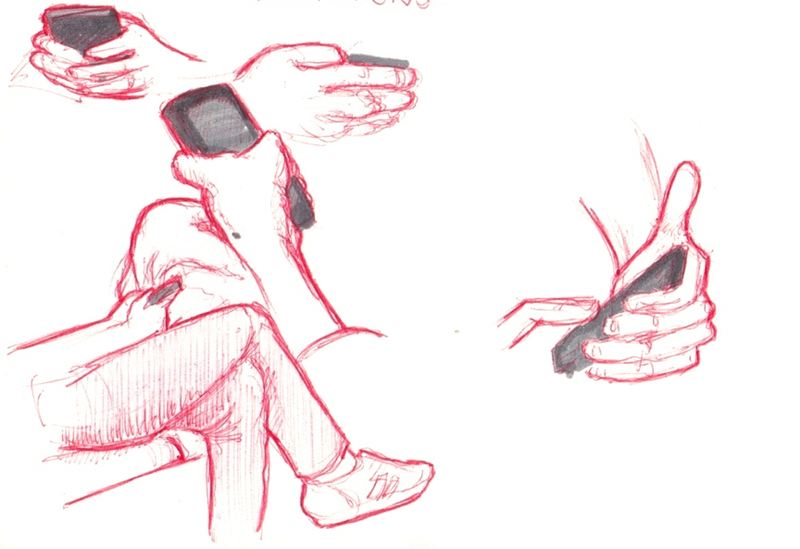 Today, on my way back from a meeting, I started sketching someone busy with her cell in the subway. I didn't get a chance to finish it before she had to leave, so I proceeded to sketch the next interesting person who was also on his cell phone. The theme was then set for this page of my sketchbook: cell phones. So I looked only for hands and cells to fill my page. It was not hard to find and a great excuse to practice sketching hands in motions. It was an opportunity to observe the various gestures involved in using a cell phone: Some hold it with one hand, others hold it with two, some use one thumb to interact with it, others use two and some use one finger. For the most part, the commuters were completely absorbed in the little world bubble they create for themselves. It's like a portal to another dimension. They are there but not really. But really it's not different then someone reading a book, a newspaper or a magazine. It just looks a little different.